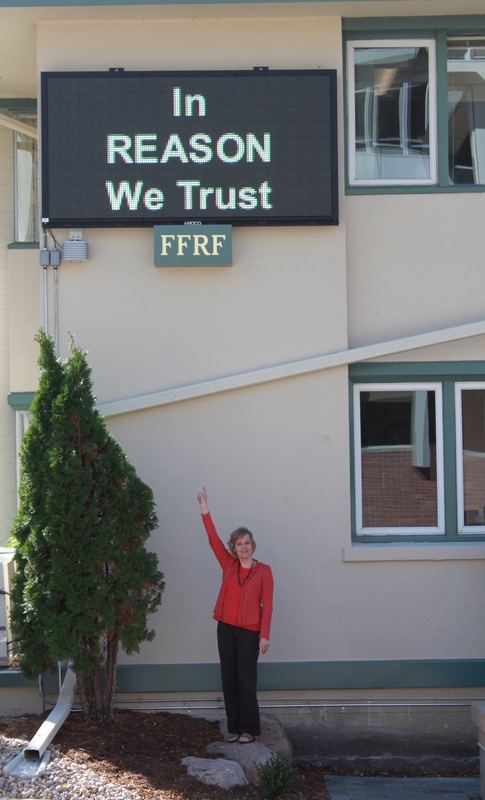 Below: The marquee was the idea of FFRF Co-President Annie Laurie. Photos: Andrew Seidel. While almost every Christian church in the United States — and according to Churchrelevance website, that’s about 320,000, including 1,250 megachurches — proselytizes its views and doctrines via a church marquee, there has been no marquee that promotes freethought. Until now. 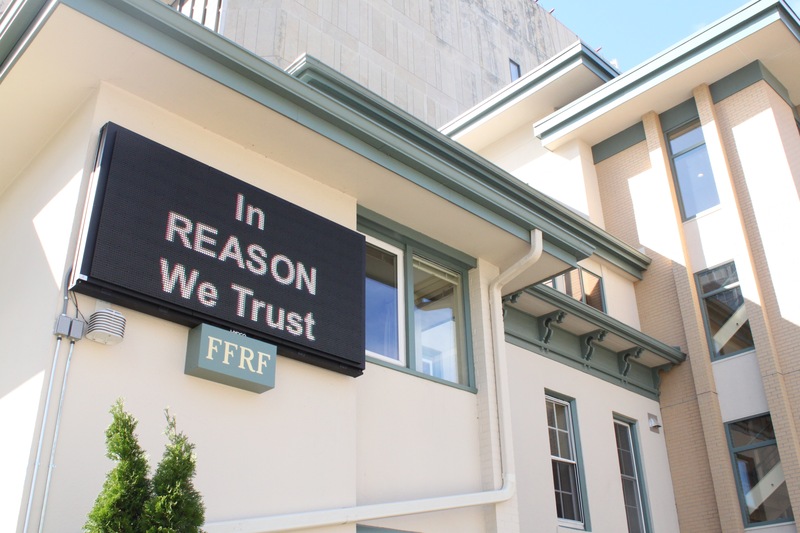 FFRF, the nation’s largest association of freethinkers (atheists and agnostics) debuted a prominent digital marquee as part of the grand opening Oct. 9 of its newly expanded office building, Freethought Hall, in downtown Madison, Wis.
“What the freethought movement has needed is a marquee of its own,” maintains Annie Laurie Gaylor, FFRF co-president and co-founder. While many church marquees feature hell and brimstone, putdowns of nonbelievers or have been regularly utilized to lobby against gay rights, abortion rights, etc., Gaylor says FFRF will keep its marquee “upbeat and positive” while still forthright. Today’s marquee wishes a happy birthday to one of its well-known honorary directors, Katha Pollitt, a feminist, poet and atheist who writes the “Subject to Debate” column for The Nation. FFRF’s expanded offices, which include a five-story addition, also feature a life-like, life-size mannequin of Charles Darwin that greets visitors to FFRF’s Joel B. Landon and Wanda K. Beers Freethought Library, among other highlights. View photos taken by FFRF Legal Extern Chris Lines of FFRF members and visitors meeting Mr. Darwin.